Last Saturday afternoon, Dennis Peron passed away in a San Francisco hospital at the age of 71. Perhaps you hadn’t heard of Peron before this weekend’s announcement, but surely you’ve benefited from his trailblazing leadership in the legalization of medicinal marijuana in California. This year, thanks to California voters, the sale and use of recreational marijuana is finally legal and many dispensaries are now able to sell cannabis flowers and products to anyone with a valid ID (21+). The battle for legalization began decades ago and Peron was at the forefront of movements in San Francisco and Northern California. Peron was born and raised in Long Island but left after high school to join the Airforce. Peron moved to San Francisco after serving in the Vietnam War and found himself living in a commune in the Haight. There he met Harvey Milk, already working as a Supervisor, and not long afterward began selling marijuana in the Castro and drawing attention to the plant’s medicinal benefits. In the late ‘80s and early ‘90s when the AIDS epidemic struck the gay community, Peron was active in spreading public awareness about medicinal marijuana and its benefits for HIV and AIDS patients. 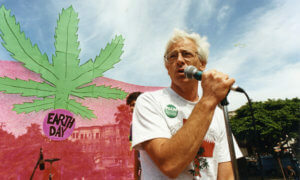 As the health crisis persisted and even took his partner, Jonathan West, in 1990, Peron became even more involved in activism for both the LBGQT community and the cannabis industry. products for sale at his San Francisco Cannabis Buyers Club. This was especially controversial because of the U.S. Drug War waged by the government at the time. Peron and his cohorts formed a resistance and worked to provide AIDS patients and others information on the benefits of cannabis. In 1996, Peron worked behind the scenes in passing Prop 215, which legalized the use of cannabis for medical purposes. The Club supplied 9,000 clients over the years but was eventually shut down in 1998 by a San Francisco Superior Court judge. But Peron was not deterred from his mission. After his Club closed he moved out of the city and began growing cannabis on a larger scale and providing patients with the living plants. One of our favorite facts about Peron was that while living and growing in Lake County he was giving away his plants to patients for free — and that certainly reflects the culture and values of the Bay Area cannabis community today. 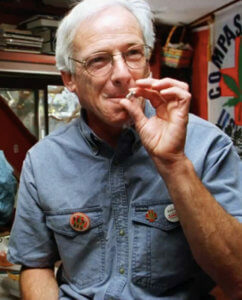 When Peron was diagnosed with lung cancer he returned to San Francisco. Last year, as Peron continued to battle his late-stage cancer, San Francisco’s Board of Supervisors awarded him with a certificate of honor. We here at Foggy Daze were saddened by the news of Peron’s passing and it brings us some peace to share the facts of his lifelong efforts promoting the health benefits of cannabis. Without his courage and activism, small business like ours may never have had a chance to legally provide clients with the highest quality cannabis products for their mental and physical wellbeing. If you’d like to read more about Peron’s interesting life and important work, he published “Memoirs of Dennis Peron” in 2012 and he had a lot of love for our great city and state.